Of Indonesia’s 17,508 islands, only about 6,000 have people living on them. Indonesia is home to thousands of different flora and fauna, making it the country with the second-highest level of biodiversity in the world after Brazil. Indonesia is the only place in the world to see a Komodo dragon in the wild. Sumatra is the only place outside of Borneo to see orangutans in the wild. Indonesia is situated on the Pacific Ring of Fire and is home to about 150 volcanoes. They’re mostly dormant, but the country does experience around one volcanic eruption and one powerful earthquake per year. To Sabbath School teachers: This story is for Sabbath, Nov 24. Farmer Petrus Tobolu was furious when he learned that his 19-year-old daughter, Monika, had been baptized into the Seventh-day Adventist Church. 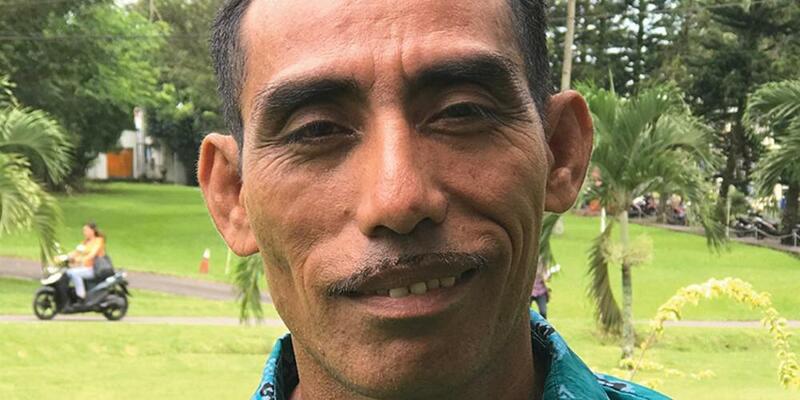 He had served as the lay pastor of the Soahukum village church on the Indonesian island of Halmahera for 35 years. He didn’t understand how the Adventist pastor could baptize his daughter without seeking his permission, and he worried that the Adventist teachings were satanic. So, he raised a big stick and beat Monika. “Denounce your convictions!” he yelled. Monika wept but didn’t say a word. This confused her father, and he wondered why she wasn’t angry. Monika was one of four young people who were baptized after Bible studies and an evangelistic series on Halmahera island. They were the island’s first four Adventists, the result of the work of two student missionaries. One day, Monika came home with a box of Adventist books. Enraged, Petrus seized the box and threw it into the garbage hole in their backyard. But as the box crashed to the ground, it burst open, spilling out its contents. A book caught Petrus’ eye: “The Almost Forgotten Day” by evangelist Mark Finley. He secretly fished the book and two Adventist World magazines out of the garbage. The next morning, he took the book and magazines with him to the field. But he couldn’t concentrate on his work. He worked until 10 a.m. and then read the book and magazines for the rest of the day. The same thing happened the next day. He compared the Bible verses in the publications with the verses in his Bible. He studied the materials for eight months. After he understood that Saturday was the biblical Sabbath, he began to preach about the Sabbath in his church. After the sermon, startled church members approached him. “No one has preached like this in a long time,” said one. “Maybe you want to bring is a new doctrine?” said another. Petrus hadn’t thought that he was introducing Adventist teachings to the church. He understood the biblical truth, and he was only trying to preach what he had learned. Eventually, he decided to worship on Saturday. When Petrus’ older sister heard about his convictions, she suggested that he join the Seventh-day Adventist Church. She had heard about the church from her daughter, who had studied at the Adventist-owned Universitas Klabat on another island. Sometime later, Petrus invited several visiting Adventist pastors to worship at his church. His church members, however, attacked the building with stones while the pastors were inside, and Petrus had to whisk them out of the village to safety. The villagers were waiting for Petrus with sticks when he returned, but he somehow managed to evade them and leave the village. He decided to be baptized into the Adventist Church. Petrus took his family to Manado, a city near Universitas Klabat, and was baptized during an evangelistic series there. When he and his family returned home, they found their house occupied by other people. They moved to a small hut in their field, and lived there for two months. Petrus’ two other children, boys aged 13 and 17, also were baptized during that time. But the villagers forbade the family from worshipping on Sabbath, so they moved to Manado to deepen their understanding of the Bible. Two years later, they returned home and renewed their friendships with the villagers. The villagers’ attitude toward the Adventist family changed. Today, Petrus is 50 and serves as church elder. He led the first evangelistic series in the village in September 2017, and three people were baptized.